Each spring, BBRR volunteers survey the Owl Woods for roosting owls that are utilizing the area as a stop over during migration. Information gained from this survey helps is used to monitor the habitat usage by the owls, and in turn helps us to manage and protect the area for the future. While the science behind this data collection is important, no one will deny that it is a true privilege to observe these magical raptors in their natural habitat. Check out our Owl Roost Survey page for more info. Read on to see just how magical the woods can be at times here at Braddock Bay, and enjoy the account and photos by BBRR volunteer Zaphir Shamma. On March 25, my wife Tanya and I were surveying for owls in Owl Woods. The day was cold and gray with strong winds. Not the best day to be out, but we were hopeful. As usual, we started out in the “classroom”, then met a man from Canada who said there was a Saw-whet back in the pines. We followed in the general direction of where he pointed and quickly found the spot. 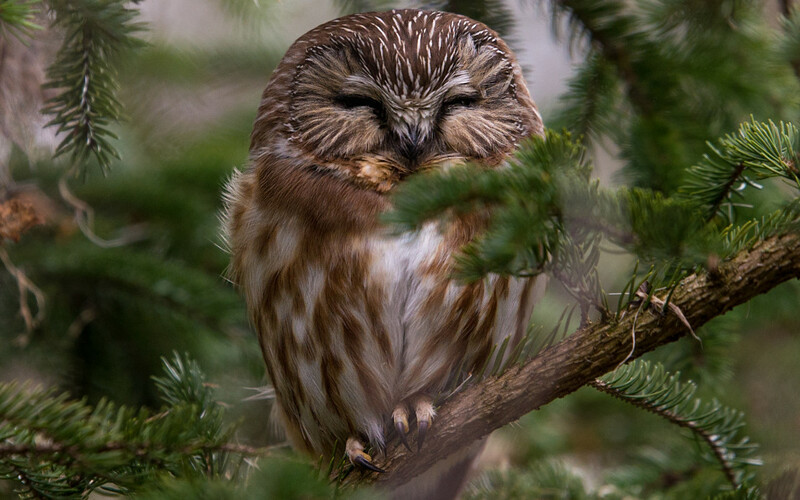 We could see a Northern Saw-whet Owl about 8 feet high and tucked deep into the tree. The owl was partially obscured by branches from every angle, but we had nice views of its front. It didn’t appear to be too concerned that we were there, and kept its eyes closed while we viewed it. We then moved down the path in the direction of the raptor banding station. Tanya wanted to investigate that one large spruce that is off the trail on the right. While searching that area, Tanya reported that she unintentionally flushed “something” and it flew off towards the east. We continued on down the path and rounded the loop. As we began to explore the tall pines on our left, Tanya stopped and said she saw an owl. She pointed about 30 feet off the ground towards a thick pine that was blowing in the wind. The bows were swinging back and forth and finally, I was able to see what she saw (but only for a second). 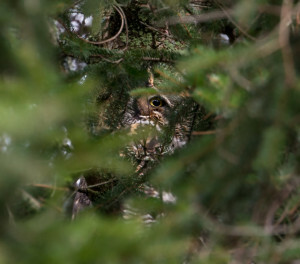 The wind-driven bows would hide, uncover briefly and then re-hide this owl. I took photos as best I could while trying to time the moving branches. While discussing if we should go back and get a better camera lens, the bird pooped, and then bolted silently in a northern direction. It was big and silhouetted, so we couldn’t tell what it was. Once we got home and examined the photos, it turned out not to be a Long-eared Owl as we suspected, rather…it was a Great Horned Owl! We feel that this was the same bird that Tanya had accidentally flushed about 15 minutes earlier. Tanya and I continued to move back towards the entrance of Owl Woods, searching as we went. Once we got close to where the paths come back together, we came across Jim Saller (BBRR volunteer) who had spotted a Long-eared Owl. 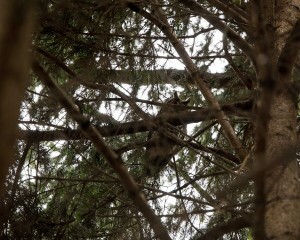 We quietly joined him and looked at a beautiful bird high in the canopy. It was dark, back-lit and silhouetted, but the outline was crisp and we knew we had a Long Ear. Photos were taken and we moved on. All in all, not bad for a gray, cold and windy day. Three different owl species (an Owl Hat-trick) in the woods that we have grown to love.